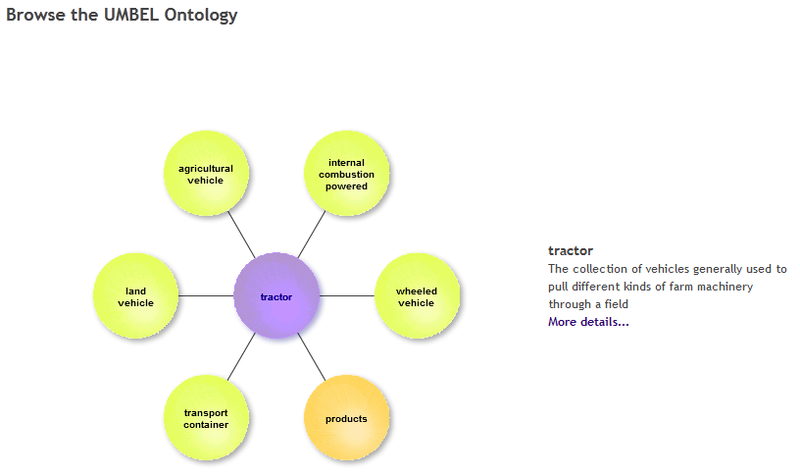 UMBEL, the Upper Mapping and Binding Exchange Layer, is an upper ontology of about 28,000 reference concepts and a vocabulary designed for domain ontologies and ontology mapping . When we first released UMBEL in mid-2008 it was accompanied by a number of Web services and a SPARQL endpoint, and general APIs. In fact, these were the first Web services developed for release by Structured Dynamics. They were the prototypes for what later became the structWSF Web services framework, which incorporated many lessons learned and better practices. By the time that the structWSF framework had evolved with many additions to comprise the Open Semantic Framework (OSF), those original UMBEL Web services had become quite dated. Thus, upon the last major update to UMBEL to version 1.0 back in February of this year, we removed these dated services. Like what I earlier mentioned about the cobbler’s children being the last to get new shoes, it has taken us a bit to upgrade the UMBEL services. However, I am pleased to announce we have now completed the transition of UMBEL’s earlier services to use the OSF framework, and specifically the structWSF platform-independent services. As a result, there are both upgraded existing services and some exciting new ones. We will now be using UMBEL as one of our showcases for these expanding OSF features. We will be elaborating upon these features throughout this series, some parts of which will appear on Fred Giasson’s blog. In this first part, we provide a broad overview of the new UMBEL OSF implementation. We also begin to foretell some of the parts to come that will describe some of these features in more detail. 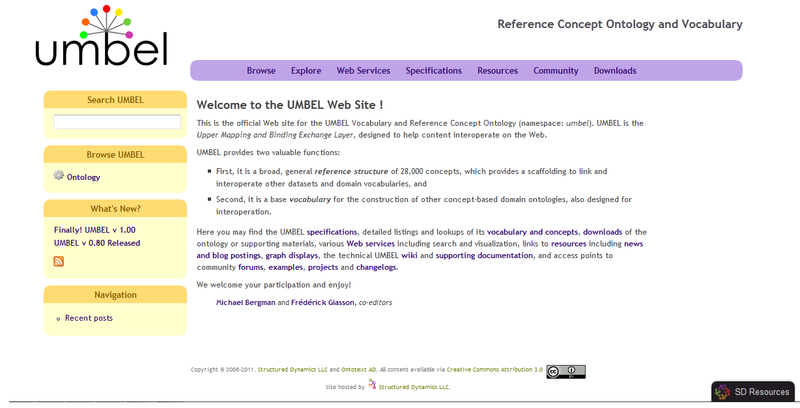 Like other vocabulary sites, the UMBEL portal contains specifications and links to community resources and downloads. It also has some specialty links not shown on typical standards sites. 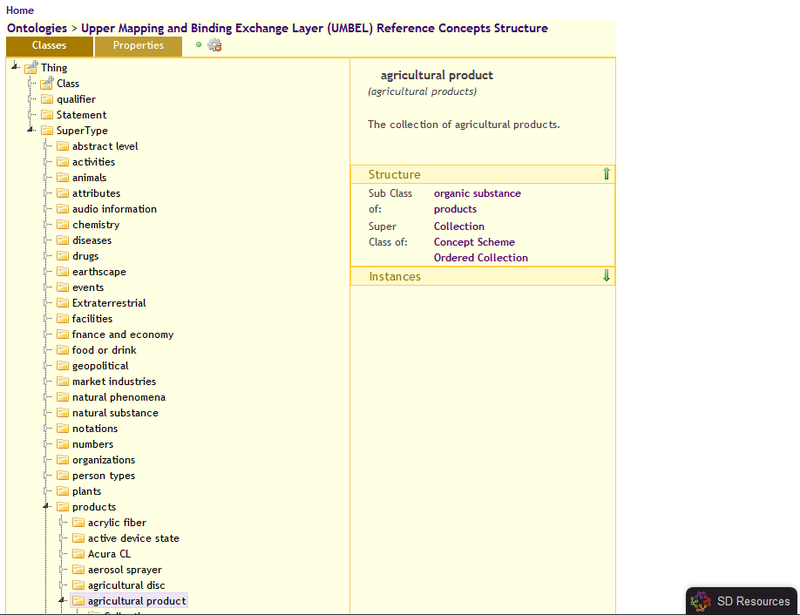 For the UMBEL site, the standard view of using structOntology is read-only. In a subsequent part we will also discuss structOntology’s full editing and maintenance mode. Like all standard OSF installations, there are two superior means for discovery and navigation of the information space: search and the relation browser. Search uses the integration of RDF and inferencing with full-text, faceted search using Solr. This has been Structured Dynamics’ standard search function for some time, as Fred initially described in April 2009. It is a very effective way for finding new and related concepts within the UMBEL structure. These various tools provide great means for discovery and navigation within the 28,000 concepts in the UMBEL reference space. We are also now providing updated endpoints for Ontology: Read, Search, Crud: Read, SPARQL and Scones. 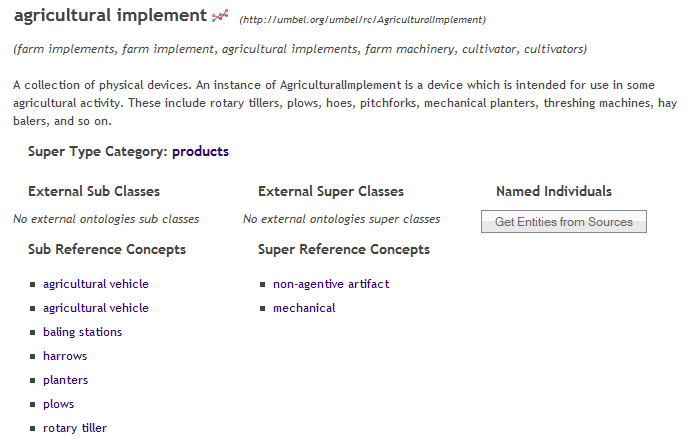 These will be described with access and query examples in a later part. We will also be discussing our OBIE (ontology-based information extraction) and entity tagger, scones, and export and ontology edit and management functions in subsequent posts. We anticipate eight or nine more parts in this series explaining most of these options in greater detail. We hope to post a couple per week or so over the coming month. We will conclude with a discussion of next pending UMBEL releases. UMBEL Services, Part 4: structOntology.